Students are asked to describe the team, its work, challenges faced and how problems have been overcome. It is also important to underline members’ roles in the team, and new skills acquired. NAO will of course be part of the presentation!! Teams are also asked to create a poster (70 cm x 90 cm), that will be exposed during the tournaments. It will have to include at least the name and logo of the team. On the website it will be available the template to be used by teams. Use of NAO – software. NAO, CAN YOU HELP ME TO…? The aim is to find an innovative hardware solution connected to NAO intended to help educators, teachers, parents…. to be fully inclusive in their educational activities. Target groups can be any age (0 to 99 years old). Goal for the challenge is to build a prototype and present one example of its usage to the jury. Design and implementation of the project will have to be carried on by the teams, but, as always with NAO, everything will have to be funny and exciting!! Teams will have to declare target group addressed and present the way they came to the Solution proposed (case study, experts activated, existing solutions…). Teams will freely choose places of possible application of the solution. Activity’s demo will have to be interactive and involve NAO and at least one team member. Depth to which the problem was studied and analyzed by the team. Presentation of the solution and of project work. Software: technical choices, fluency, stability, dialogs, interactions.  Demo – Design, fun, relevance, animations, accessories. Originality. Bonus: interaction with more than 1 person. Educators job is very hard and includes preparing different lessons for different child to be the most inclusive. Autism spectrum disorder is one of educational areas where NAO is proved to have great results in improving teachers’ job for inclusion. One of difficulties for these students is to choose and ask for something. It has been proved that interaction with NAO is much easier. Students can start by exercising in asking to a Humanoid thus later be gradually used to make their request directly to their parents, teacher, class mates and finally any other person. 3 to 6 lanes (according to space and number of teams in the tournament). Each lane is 3,00 m long and 0,60 m wide. At the end of each lane is a panel with 2 big buttons (random colors) and two images of different objects the child could choose. On the panel team is allowed to tack anything it believes to be useful to complete the challenge. After start, the judge will communicate which object the child (played by one student of the team) will have to ask to NAO. 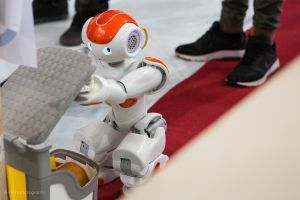 The child can ask NAO the object the way the team prefers: touching one of NAO touch sensors, by showing an image of the object with a QR code, using a TAG or by vocal request. 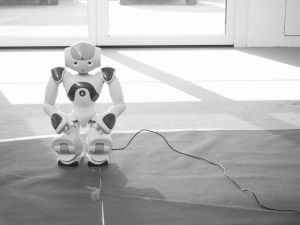 As soon as team believes NAO has “understood” the child request, will give the robot the ready to start command (ex. by touching one of NAO’s head). 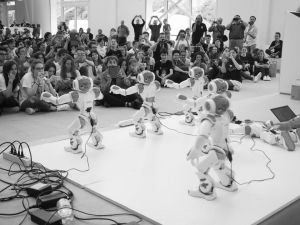 At this moment NAO’s eys will become green, Softbank and Scuola di Robotica will provide each team an application which allows to synchronize NAOs so that the start for the race can be given by the judge. As soon as NAO will arrive to the panel and press the right button the arrival time will be registered. 1 TO 6 TEAMS WILL PLAY on the field at the same time. Me & You game is about creativity, team spirit, video-making, capability of interacting exchanging ideas inside and outside NAO Community. Publish news and communicate how your team is working, your projects, your difficulties and how you are going to find the solutions. Be active Community’s Forum, tickle other teams with amazing videos and get new ideas reading those of other teams from all over Europe! 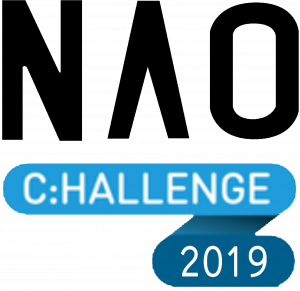 To be sure contents you post are well scored they shall be announced on Community forum; name and descriptions must include this information: “NAO Challenge 2019”, Team NAME, Nation, School name. create your team pages/account, quote @naotherobot in your posts. 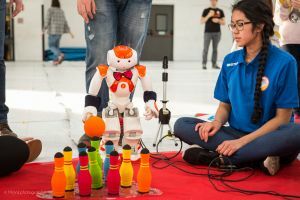 Tournaments are exciting events with head-to-head competition, judging interviews, and Teams and Robot performance awards. Teams will prepare their robot to present to the juries test A and B. Test C is a head to head challenge which will see up to 6 teams playing on the same field. Test D will be evaluated the day before the tournament. Ranking in the different tests will give the team scoring (1 for the best team, 2 for the second…). The team which will get the lowest scoring after adding the scores obtained in the 4 tests will be the winner of the tournament. Grants will be awarded to best Teams of each test rank. Juries will be made of teachers, institutional partners, engineers and robotic experts. 5 minutes: Teams presents to the jury and to the public. Each Team will have 10 minutes time (setting included) to present and show its demo to each jury. Each test will start with team presentation to the Jury about scenery, adopted solutions and team work. Will be particularly appreciated solutions which will demonstrate fun, simplicity, fantasy and creativity. NAO’s behaviour will be evaluated as it should be in real life situations and not only according to demo’s results. Each test will be evaluated separately. Awards will be announced at the end of the day in each tournament. Judges will use evaluation grids* to help them determine which teams will receive awards. Awards will be determined by a deliberation process, which is formulated around discussions of team performance in each category. Final evaluation will be the result of deliberation process of all the juries together.